Thursday 22. February 2018 - BOBST machine technology and service effectiveness have allowed the Senegalese company to become a leader in its market and to play a key role in development of packaging in Africa. A transformational leader in industrial packaging in Senegal, La Rochette Dakar, covers 80% of its country’s demand for corrugated cardboard boxes. 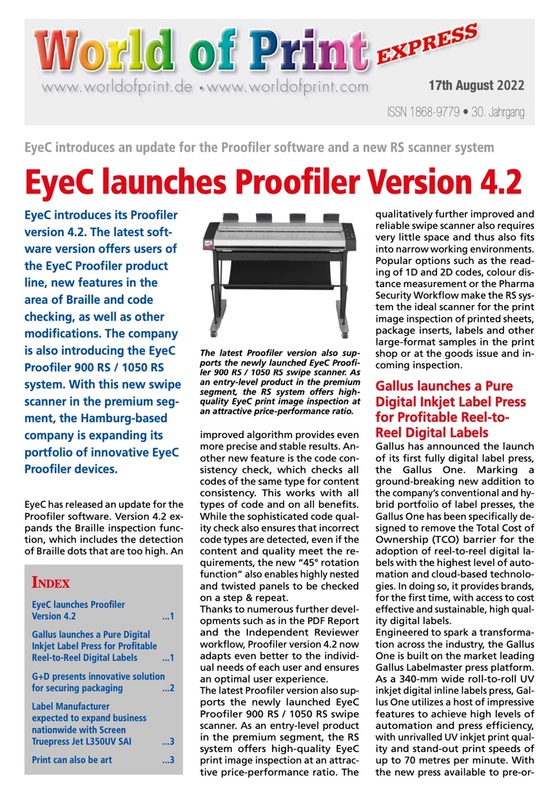 In April 2017, the company installed a DISCOVERY FFG 8.20 gluer in its Dakar plant (see sidebar below). Developed by Bobst Lyon, this machine allows four-color flexographic printing and in-line folding-gluing. This equipment is especially suited to the company’s needs, because of its ease of use and very high performance (its production can reach 18,000 boxes per hour). It assembles American boxes in one pass, using corrugated cardboard sheets. The production rate has increased 50% and reduced delays between the corrugation shops and the box plant. The forming quality (printing, trimming and gluing) has improved significantly. Four-color printing has offered the company a chance to develop new types of packaging. At its production site in Dakar, spanning more than 50,000 m², the 245-employee Senegalese company focuses on industrial packaging and printing. Its activities include producing American corrugated cardboard boxes, converting flexible boxes, paper bags for Kraft and self-adhesive labels, along with printing of publishing products (brochures, planners, posters, leaflets, flyers, calendars, etc.). La Rochette Dakar actively pursues a strategy of modernizing its production equipment. Since 2016, it has been growing and making large investments in its plant. It has bought an in-line corrugator and two BOBST gluers, and sent an order to the Swiss company for a new Autoplatine VISIONCUT 106 LER die-cutter in July 2017. Like other countries in Africa, Senegal hopes to export more products, especially to Europe. Packaging plays a strategic role in access to these new markets: Packaging for food products and commodities must meet very strict international sanitary, phytosanitary and traceability standards. Thanks to BOBST technology, La Rochette Dakar has acquired high-end equipment to speed its growth and play a key role in Africa’s packaging industry. Now La Rochette Dakar is the packaging industry leader in Senegal and the entire West African region. Its exports are growing full tilt, especially to Mali, Guinea, Gabon, and recently to Gambia and Mauritania. Number one in packaging in Senegal, La Rochette Dakar opened its plant in 1946. Originally called the “Colonial Packaging Company”, the company took its current name in 1960. A Senegalese family group bought the company in 1983. 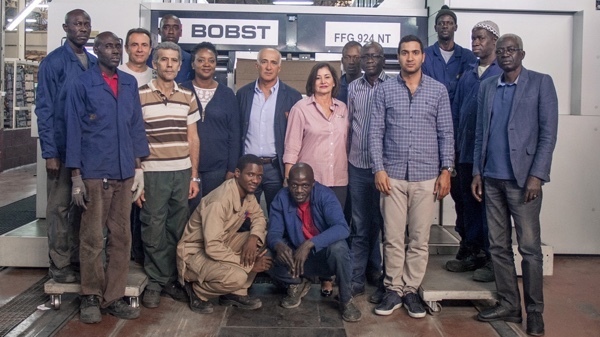 For more than 35 years, it has collaborated with BOBST to modernize its production site in Dakar, equipping a quality control laboratory and acquiring high-tech machines for transforming cardboard and paper. La Rochette Dakar has more than 1,000 customers, including several large international brands, and works in industries as varied as tobacco, agrifood, pharmaceuticals and telecommunications. This technological development has allowed them to include companies as demanding as Philip Morris International and Nestlé among its production customers. In 10 years, the company has evolved from a local to an international supplier. Modernizing its production site has allowed La Rochette Dakar to produce packaging and printing with strong added value. These high-quality, sophisticated products require printing with special varnishes, embossing and special trimming. Complex assembly processes are now possible thanks to the latest-generation machines’ repeatability and register control functions. Today, La Rochette Dakar has become a factory of reference, where its customers experiment with new products before launching them on the market. Owned by a Senegalese family group since 1983, La Rochette Dakar is making massive investments in modernizing its packaging production lines. Adel Salhab, the company’s CEO, describes his industrial strategy. Why did you establish this strategy of modernizing your equipment? Adel Salhab: African countries produce food commodities, and Senegal wants to export to the European and American markets. But the hygiene standards and sanitary demands imposed at the borders require suitable packaging. Acquiring high-technology package machines allows La Rochette Dakar to offer packaging solutions that meet international standards. Our plant has already been ISO 9001 certified for 17 years and also meets international safety and environmental requirements (4-pillar SMETA certification). Since 2007, we have also worked as an approved supplier for large multinationals, like Philip Morris, and have several contracts at the global level. Our new investments in ultramodern equipment allow us to give our clients products of a strength and printing quality equivalent to those provided by packaging producers anywhere in the world. Moreover, we will be able to deliver to most of our customers within 48 hours, thanks to a 35% to 40% increase in our machines’ up time, which considerably increases our production capacity. We are already making cigarette packs and cartons for all of Africa. This new stage in our industrial strategy strengthens our position in Senegal and will increase our market share in West Africa. How did you choose BOBST? We put our trust in the BOBST company 35 years ago. Still today, their technology matches our development strategy and plays a key role in our growth. For one thing, their advanced packaging solutions are transforming our site into an industrial unit that meets Western requirements. Our printing and trimming meet international quality standards. We have almost no returns of defective merchandise or complaints from our customers. Secondly, the performance of BOBST equipment meets the challenge of the local market and the demands of international brands. We can now systematically honor our commitments to deliver to our customers within 48 hours. This is quite a plus, because it puts us way ahead of all our competitors, whether in Senegal or abroad. Has installing ultra-modern equipment changed the way your operators work? Compared to our old equipment, these new machines operate at an impressive speed. The time spent on certain operations is a third of what it was before, for much better quality. The modern production lines’ simplicity and ease of use have also surprised our operators. But it’s not enough to have high-performance equipment — you have to master it and use it correctly. This is another of BOBST’s strengths — without a doubt. When the machines were commissioned, technicians gave our teams very detailed training on the programs. Moreover, our operators are regularly informed of the latest technical developments. This lets them continue to optimize our machines’ output to give our customers ever-improving quality with regard to delivery time and competitive prices.